SpaceShipOne is a space plane that, on June 21, 2004, became the first private piloted craft in history to reach the edge of space – an altitude of 100 kilometers (64 miles). It was designed and built by Burt Rutan and his Californian company, Scaled Composites. The rocket plane, developed in just a few years, had room for a pilot and two passengers. 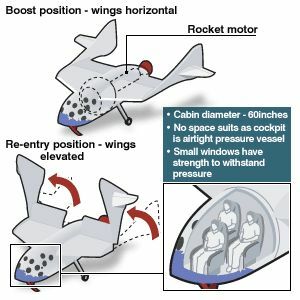 The passenger seats were empty for the first space flight, which was piloted by Scaled Composites vice president, 62-year-old Mike Melvill. 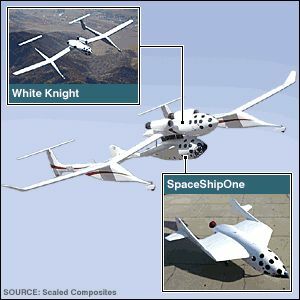 SpaceShipOne was carried to an altitude of more than 14 kilometers (47,000 feet), slung beneath the White Knight craft. It was then released and glided for a few seconds before the pilot started the rocket and pointed the vehicle straight up. Its speed exceeded Mach 3 (three times the speed of sound). SpaceShipOne was designed to just break the Earth's atmosphere. The pilot experienced three minutes in a near-weightless environment. At the top of its flight, the vehicle had to adjust its wings into a high-drag configuration so that when it fell back to Earth its speed was controled and heating of the airframe was minimized. SpaceShipOne glided back to its base in the Mojave Desert, returning just under two hours after White Knight lifted it off the ground. White Knight and SpaceShipOne were revolutionary in a number of ways. SpaceShipOne's hybrid engine needed special fuel that was safer, and both White Knight and the ship could be reused. SpaceShipOne's rocket motor, which was custom-built by SpaceDev of San Diego, burned a solid rubber propellant with liquid nitrous oxide – a liquid version of "laughing gas". It isn't volatile and is more eco-friendly than other space rocket fuels. Its byproducts are water vapour, carbon dioxide, carbon monoxide and nitrogen. In October 2004, SpaceShipOne won the $10 million Ansari X-prize for the first private reusable spacecraft. It did this by making two flights inside two weeks with a pilot plus ballast equivalent to two passengers. The ship has now been retired to the Smithsonian's National Air and Space Museum in Washington DC, but its technology is already taking the next step forward. Rutan's company has announced that it will build SpaceShipTwo, a passenger-carrying successor to SpaceShipOne. Five of these new craft have been ordered by Virgin Galactic, a company founded by British entrepreneur Richard Branson. Virgin Galactic plans to offer flights into space for about $180,000 (£100,000).